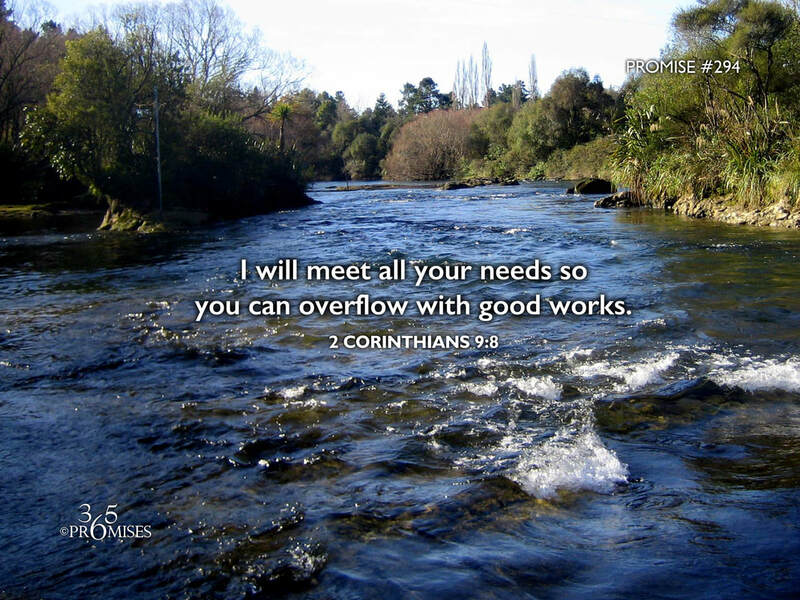 I will meet all your needs so you can overflow with good works. may abound to every good work. It is by grace that we are saved and it is God's gift to us so that we won't be able to boast about it. (Ephesians 2:8) It is this same grace that abounds to us and meets all of our needs so that we will overflow in every good work. The NIV Bible says 2 Corinthians 9:8 this way... And God is able to make all grace abound to you, so that in all things at all times, having all that you need, you will abound in every good work. This Bible verse really speaks of the principle of abundance. God wants us to overflow with His grace at all times and in every situation. I believe the key to this principle of abundance is found in Matthew 10:8. This is where Jesus is sending out His disciples to proclaim the good news of the gospel. His charge is simply this... 'freely you have received, freely give'. One of the things that I am learning in my walk with God is that I first need to be in a place of receiving before I can have anything to give to others. I am convinced that it is out of the overflow of His love and grace in my own life that others are touched. So my simple encouragement today is for you to learn to receive all the grace that God wants to give you. As you receive the abundant, never ending supply that flows from heaven, it will overflow in your life so that you will have all that you need to do every good work that He has planned for you.